FLORENCE- Normally this time of year Pinal County Division of Environmental Health Vector Program crew mates Tami Schuler and Garry Bouquot keep themselves busy trapping and testing mosquitoes for any signs of West Nile virus. But now with the housing slow down another challenge to keep mosquitoes at bay has landed on their doorstep, so to speak: Foreclosed properties with swimming pools that have been neglected and are becoming breeding areas for mosquitoes. "These pools have become a bigger problem than ever in our efforts to control mosquitoes," said Environmental Health Specialist Tami Schuler. "In prior years the number of vacant homes with neglected green swimming pools averaged around 30 in any given year. In all of 2007, we had a total of 115 reported neglected pools at vacant properties. As of May 27th, we have 117 active neglected pool complaints, for 2008." So now, along with their mosquito trapping and testing activities, Schuler and Bouquot are attempting to contact property owners, banks, or foreclosure trustees' by any means necessary. "Our Assessor's website is a great tool to help us find the owners," Schuler said. "If we can't find the owner that way, we will call the banks and try to track down the owner through them." It is simple to treat a green pool with chemicals that stop the growth of mosquito larve. "It's nice that there are chemicals that will keep the mosquitoes at bay, but really we would hope that the owners would drain the pool before they leave to reduce health and child drowning hazards," Schuler stated. Statewide numbers of West Nile have been very low in the beginning of 2008 due to a cool spring and low rainfall. Statewide, only two cases of mosquito West Nile infection was reported in the Yuma and Maricopa County. "We've been trapping for two months," Schuler said. "We have placed 115 traps and tested 62 mosquito samples. None of the samples have shown any signs of West Nile." Schuler and Bouquot credit Pinal County residents for their past efforts at keeping their properties free of standing water. They are now asking residents to report any abandoned pools to their mosquito hotline at 1-866-287-0209 extension 6200 or (520) 866-6200. "The residents have come through in the past, we are counting on them again to help us stem the mosquito population," Schuler said. "All of us working together make a great team against West Nile and mosquitoes." Drain all standing water where mosquitoes can breed. This includes buckets, tires, cans, jars, bottles, and other containers that can hold water. Keep grass trimmed. Mosquitoes like to hide out in tall grass. Change water in outdoor flowerpots, birdbaths and pet watering bowls located outdoors at least twice per week. Casa Grande, Arizona - The Casa Grande Regional Medical Center Foundation (CGRMC), with sponsorship by SRP, invites the public to an encore presentation of the March 31, 2008 "Lunch and Learn" entitled, "Acupuncture 101". It will be held on Monday, June 9, 2008, from 12:00 noon to 1:30 p.m. in the Education Center at Casa Grande Regional Medical Center. After a complimentary lunch, Dr. Kathleen Bishop will once again address the audience with her presentation of "Acupuncture 101". Dr. Bishop is an Anesthesiologist at CGRMC and also sees acupuncture patients, on campus, in the Physical Therapy Department, Building A, Suite #102. Reservations are required for this event. Please call the Foundation reservation line at 381-6300, ext. 5840, with your name, number of people attending and a phone number. Space is limited to the first 70 reservations. FLORENCE- The Pinal County Board of Supervisors acted upon the recommendation of a search committee by appointing Andrew M. Ramirez as Justice of the Peace in Precinct One. Ramirez will replace outgoing Judge Kema Granillo who is retiring on Sunday, June 1. "This is a very exciting opportunity," Ramirez said following his appointment to the post. "I want to thank the committee and the supervisors for the selection. I know there is great responsibility with this position." Presiding Justice of the Peace Toni Lorona said that the committee had some great candidates from which to choose. "I will be up front and say it was a difficult choice," Judge Lorona said. "All three candidates for the vacancy were well qualified. The committee was fortunate to have such good people interested in public service." "Once I started working inside the Superior Court two years ago, my eyes were opened to how exciting the courtroom can be," Ramirez said. "I will approach this new position with the same enthusiasm I had with the Superior Court." State statute dictates the position will be open in this upcoming campaign cycle. Ramirez said he intends to run for the position this fall. Precinct One coverage areas include the municipalities of Florence and Coolidge. There are eight Justice of the Peace precincts in Pinal County. Justice of the Peace courts hear both civil and criminal cases. Civil jurisdiction is limited to only $10,000. Criminal jurisdiction is limited to petty offenses and misdemeanors. FLORENCE -- The Pinal County Public Health Services District is issuing an advisory for measles after the disease was diagnosed in a child under the age of one in the San Manuel area. Public Health officials are actively investigating the case. Health officials believe this case is connected to the outbreak of measles under investigation in Pima County. Pima County has identified 21 people infected with the measles virus. Measles is a highly contagious disease whose symptoms include fever, cough, runny nose, and red eyes. It is spread through the air in droplets and by contact with the secretions from the nose and throats of infected persons. The incubation period from being exposed to an infected person to getting symptoms is about 10 days. Complications may include ear infections, diarrhea, pneumonia and encephalitis. About one to two children in every thousand infected with measles die from the disease. Pregnant women infected with measles have a higher risk of miscarriage, low weight babies, and premature delivery. "Vaccination is the best way to avoid getting measles. Anyone who has not previously had measles or been appropriately vaccinated is at risk of contracting measles," said Tom Schryer, Director of Pinal County Public Health, "It is important to make sure that your family is vaccinated. Because measles can be more severe in infants and very young children, we are recommending an accelerated vaccine schedule for children in Pinal County." Pinal County Health officials recommend that all children between the ages of 6 through 11 months receive a dose of measles vaccine. Two additional doses are needed after the first birthday. Parents should make sure that their children have received at least two doses of measles vaccine after their first birthday. Children in Pinal County who have received one dose of measles vaccine at age one or older should receive their second dose as soon as possible, but with a minimum of 28 days between vaccinations. For those without insurance, measles vaccination for children 18 years old and under is available free of charge at any county Public Health clinic. A list of clinic locations is available at http://pinalcountyaz.gov/Departments/PublicHealth/Pages/OfficeLocations.aspx. Adults should also make sure they are immune to measles if they have contact with infants less than a year old. The same recommendation is being made if adults are with people who are taking medications that suppress their immune system or have a disease that affects their immune systems. If you, or a family member, have symptoms of measles, such as fever and a rash, please call your health care provider. Because measles is highly contagious, it is important to notify your health care provider or facility BEFORE arriving so that they can prepare to care for your family member. For more information about measles please call the Pinal County Citizen Contact Center at 520-509-3555 or toll free at 1-888-431-1311. You may also call the 24-hour Pinal County Information Hotline at 1-866-763-7252. Information about measles is also available on the websites for Arizona Department of Health Services http://www.azdhs.gov/measles and the Centers for Disease Control and Prevention at http://www.cdc.gov. within the boundaries of Pinal County. What is a special district? elected by the people they serve." 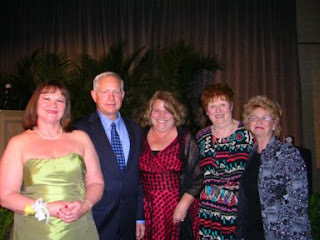 Casa Grande, AZ – Deborah Hudak, D.O., Family Practice Provider at Sun Life Family Health Center, received the Arizona Osteopathic Medical Association's (AOMA) Volunteer of the Year award at the Presidential Gala Event held on April 18, 2008, during the AOMA Annual Spring Convention. The AOMA Board of Trustees awarded Dr. Hudak because of her volunteer efforts through work with the AOMA's education committee since 1996, as a District 7 Representative of the AOMA's House of Delegates since 1997, and her work with the Arizona Osteopathic Charities since 2004. Additionally, she was recently named to serve on the Board of Directors of the Arizona College of Osteopathic Family Physicians. Dr. Hudak has been a member of the Zonta Club of Casa Grande Valley, since 2000, serving as a member of the Board of Directors since 2002, and a member Zonta's Charitable Foundation established in 2007. Zonta International is a Business and Professional Women's Service Organization holding a non-governmental organization seat in the United Nations and whose mission is to promote the status of women everywhere through service and advocacy programs. Sun Life Family Health Center is a not-for-profit organization providing health care to Casa Grande, Eloy, Coolidge, Maricopa, Mammoth, Oracle and San Manuel. The Casa Grande facility is the flagship of the organization, offering multi-specialty services including Family Practice, OB/GYN, Dental, Radiology, Pharmacy and Laboratory. The San Manuel facility also offers Laboratory, Radiology and Pharmacy services. Behavioral Health services are also available at the Casa Grande and San Manual facilities. Sun Life is one of two community health centers in the state receiving accreditation from the Joint Commission. Casa Grande, AZ – Patients using Sun Life's OB/GYN services can expect improved check-in and check-out services. Sun Life has built a new separate front desk area for women using the providers' specialty services, making patient visits quicker and more personalized. Women can use the OB/GYN services at Sun Life's Casa Grande office, 865 North Arizola Road, or call 520-381-0380 to make an appointment. Photo L-R : Deborah Hudak, D.O., Sun Life CEO Travis J. Robinette and his wife Cindy Robinette, Zonta Members Linda Godbold and Sally Teske. My apologies to the Gentle Reader: life and the press of juggling attorney talk to finalize the agreements connected to the Union Pacific Railroad double-track project, budget discussions, and parts of the business of Pinal County conspired to keep me from my usual commitment to submit this column to your news media outlet in a timely fashion. And now that it's the middle of May, I can promise you that this will be blessedly brief! The life part of this distraction arrived at 9:54 a.m. on Thursday, May 1st – his name is Chandler Armand Andersen and his incredibly proud parents are Paul & Jill Andersen. And, although I'm a realist enough to admit that he may not be THE world's most perfect and cutest baby, his parents and grandmother certainly think so … and who am I to argue with those folks. He is, however, very good looking and well behaved (for a newborn) and a delight to hold and cuddle. But I digress. Meanwhile, back in the offices of the County, life has been focused on tracking the discussions about budgets, revenue shortfalls (at the State level) and how the various proposed legislative solutions will (or might) impact County budgets, programs, and/or residents, and other issues. Let's focus on the County budget first. At this point in time, we appear to have taken all appropriate steps necessary to complete this current fiscal year (ending on June 30th) without any further remedial action. The same may not necessarily be said for the proposed budget for FY 2008-09. Budget planning for the coming year is playing against a background of a mandate from the County Board of Supervisors to lower the primary property tax rate to $3.43 as well as a wary eye on county-related consequences resulting from the State Legislature's headlong plunge toward a state budget for the coming year. The rolling 180 day hiring freeze is still very much a factor in the budgeting landscape for all departments and offices, along with instructions to plan on no significant capital projects or increases in new staff. Managers and staff were asked to submit proposed budgets with three scenarios – no increase, a 5% reduction and a 10% reduction. All of the County's rolling stock is being evaluated with an eye to seeing if we can continue on with minimum replacements. In the meantime, the Board of Supervisors has reinforced its statement of intent to adopt a budget that – if at all possible – will keep our workforce whole and avoid layoffs while seeking to minimize any increases in medical insurance premiums or employee contributions to the retirement system. However, cost-of-living and/or longevity adjustments may be in jeopardy – as may county personnel levels – if the state legislature's final budget for the FY '09 year substantially tinkers with state revenues or funding formulae that support services and/or programs that are mandated by the state. So, all in all, it's been a busy month already and the pace of work for all us in Pinal County continues. Worries about the drought (both the water drought and the housing market) continue to be at the forefront of discussions and concerns as we move cautiously ahead with plans for FY 2008-09. Stay tuned for more next month after the State Legislature has (hopefully) adjourned. 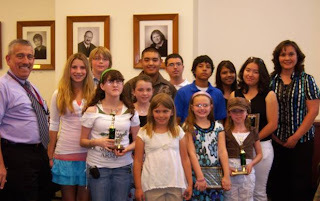 Pinal County Juvenile Court Community Advisory Board hosted a Character Counts Essay Contest for schools in Pinal County. Winners were chosen based on their essays about one of the six pillars of character: responsibility, citizenship, respect, fairness, caring and trustworthiness. FLORENCE – Presiding Judge Boyd T Johnson has announced a sweeping reorganization of Pinal County Superior Court effective April 15, 2008, to enhance the Court's ability to serve the public and handle its growing caseload with existing resources. This reorganization is the result of several months of planning by Judge Johnson, which eventually included all of the Judges and Court Administration. Beginning in the closing months of last year, the nine Superior Court Judges who serve in elective offices, along with the full-time grant funded Judge pro tempore and the full-time Family Law commissioner (who also serves as a Judge pro tempore), worked at Judge Johnson's direction to discuss how to better serve the public and increase the efficiency of the Court system without seeking or utilizing any additional resources at this time. As a result of those discussions, Judge Johnson has issued Administrative Orders that establish four specialized Courts: Civil Court, Family Court, Juvenile Court and Criminal Court. About the reorganization and reassignment of Judges, Johnson says: "Assigning responsibility for handling related types of cases to a limited number of judges, assigned to a specific area of law, will allow those assigned judges to become intensely familiar with that area of law thereby increasing the capability and efficiency of each individual Judge. Appointing a Presiding Judge for each specialized Court gives that Judge and the others assigned to that Court, time, incentive and authority to develop fresh ideas and perspectives on the manner in which that Court processes its cases." "It should be reassuring to the public that all of the Judges are dedicated to being more knowledgeable and efficient in deciding the cases that come before them. Rotating the nature of the assignment that each Judge receives allows each Judge, during the period of a particular assignment, an opportunity to learn new skills or sharpen existing skills in a particular area of law," Judge Johnson explained. "It also conveys the message that no single area of law is more important or valued than any other; each area of law deserves the best skilled and trained attention possible. Our bottom line goal is better service to the public we serve." Judge Stephen McCarville shall serve as Presiding Integrated Family Court Judge as well as being the Associate Presiding Judge for the entire Superior Court. Judge William J. O'Neil will also continue to serve as the Presiding Judge of the Domestic Violence Court. Judge Kevin D. White, effective July 1, 2008, shall be assigned as Presiding Judge of Family Services Conciliation Court. Judge Vanderpool shall serve as the Presiding Judge of the newly-developing Mental Health Court, working closely with the County Public Health Department and the County's Mental Health Liaison, Ms. Dianna Kalandros. "The public should be pleased that there is such a great assembly of talented individuals on the Superior Court Bench. I believe this organizational restructuring will enable each Judge to focus on an individual area of law and find the most efficient method for turning the available court resources and talents into a successful organizational performance. By assigning Presiding Judges to the individual Courts and giving each the authority to improve the process within their assigned Court, I know that the Judges will provide the public with prompt implementation of changes in law and procedure, innovation and an increased responsiveness." For more information, contact Superior Court Administration at 520-866-5400. FLORENCE- The Pinal County Public Health Services District is issuing an advisory for animal rabies to all residents of Pinal County. On May 9, 2008 a skunk found in the Maricopa area tested positive for rabies at the Arizona State Public Health Laboratory. This is the eleventh animal to test positive in Pinal County in 2008. The skunk was killed after a fight with a dog. Public Health personnel are investigating to make sure that there are no human exposures. "The dog was not vaccinated as required by law and will have to be euthanized to prevent transmission of the virus to humans," said Pinal County Public Health Director Tom Schryer. The identification of rabid animals statewide serves as a reminder of the potential for rabies in wild animals in Arizona. Rabies is an infectious disease that affects the nervous system, including the brain and spinal cord of animals and humans. It is caused by a virus present in the saliva of infected animals and is transmitted to humans through contact with the live virus. Rabies is fatal to humans once symptoms appear. There has not been a documented case of human rabies in Pinal County for decades. While human exposures to rabid animals are rare, family pets are more often exposed to wild animals, including wild animals that are rabid. Vaccination against rabies is available through your veterinarian or county animal care and control for pets. This will prevent them from getting rabies if exposed to a rabid animal. Unfortunately, household pets are often not vaccinated against rabies and need to be put to sleep after having an exposure to a wild animal. Please contact Pinal County Animal Care and Control for more information concerning rabies vaccination for pets and vaccination clinic times and locations at (520) 509-3555 or toll free at (888) 431-1311. Rabies is found mainly in wild animals such as bats, skunks, foxes, raccoons, bobcats, and coyotes. Cats, dogs, and livestock can also become infected with rabies if they are bitten by rabid wild animals and they have not been vaccinated. Rodents such as rats, mice, gerbils, guinea pigs and squirrels are not likely to be infected with rabies. Wild animals exhibiting unusual behavior should be reported to local animal control officials. The best way to protect yourself and your family is to avoid touching, handling, or adopting wild or stray animals. The first sign of rabies is usually a change in the animal's behavior. Animals may act more aggressive or more tame than usual. Animals usually active at night such as skunks, foxes, and bats may be out during the day. Rabid animals may appear agitated and excited or paralyzed and frightened. Sometimes, rabid animals do not show any signs of illness before death from rabies. That is why contact with wild animals should always be avoided. · Keep people and pets away from wild animals. Do not pick up, touch, or feed wild or unfamiliar animals, especially sick or wounded ones. If someone has been bitten or scratched, or has had contact with the animal, report it immediately to animal control or health officials. · Do not "rescue" seemingly abandoned young wild animals. Usually, the mother will return. If the mother is dead or has not returned in many hours, call the Arizona Game and Fish Department. · Vaccinate all dogs and cats against rabies. Pets should be kept in a fenced yard. · Take precautions when camping, hunting or fishing. Avoid sleeping on the open ground without the protection of a closed tent or camper. Keep pets on a leash and do not allow them to wander. · Do not disturb roosting bats. If you find a bat on the ground, don't touch it. Report the bat and its location to your local animal control officer or health department. Place a box over the bat to contain it. Be careful not to damage the bat in any way since it must be intact for rabies testing. For more information about rabies, call the Pinal County Public Health Services District at (520) 866-7347, or the Arizona Department of Health Services at (602) 364-4562. CENTRAL ARIZONA COLLEGE- The Pinal County Department of Public Works has announced that a traffic control change has taken effect as of Thursday, May 8, in the Central Arizona College area. The new traffic control change consists of a new four-way stop at the intersection of Overfield & McCartney Roads. This four-way stop condition is installed as an interim measure while a new traffic signal is being designed. Motorists are advised to give special attention to this traffic control change and all posted regulatory signs. To keep current on roadway conditions including road closures within the county, please call the Pinal County Road Information Line at (520) 866-6078 or visit the Public Works website at http://pinalcountyaz.gov/Departments/PublicWorks, click on "Current News Release" or "Road Closure Information." At the podium is Pinal County Board of Supervisors Chairman David Snider. 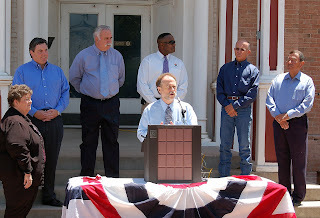 From left to right are Supervisor Sandie Smith; Scott Moore, Vice President of Public Affairs for Union Pacific; Casa Grande Mayor Bob Jackson, Eloy Mayor Byron Jackson, Maricopa Mayor Kelly Anderson and Supervisor Lionel Ruiz. FLORENCE, Arizona – Today the Pinal County Board of Supervisors, along with mayors from Casa Grande, Maricopa and Eloy announced a landmark agreement between the cities, county and the Union Pacific railroad. The agreement is of historic importance because it represents a commitment of all parties to make our communities safer with technology and permanent structures – not just today, but in decades to come. "Specifically, this agreement sets forth a 25-year commitment to constructive cooperation and financial support for safety improvements," David Snider, Chairman of the Pinal County Board of Supervisors said. "The railroad will be committing a total of $35 million dollars to design and construct at least three, possibly four, grade-separated crossings over a 25-year period." Grade separation means you take automobile traffic completely out of the path of trains – either by constructing overpasses or underpasses. Saying that local decisions are best made at the local level, the Pinal Board of Supervisors thanked the mayors of Casa Grande, Maricopa and Eloy for their participation in the discussions leading up to the agreement. When Union Pacific announced plans to build the first new border-to-border rail expansion in more than 50 years, local officials knew that they would be affected by the crossings. Delays at rail crossings frustrate commuters, but rail is still the most efficient way to move consumer products to distributors and stores. Connections to rail infrastructure also enhances economic development by providing an important link between products, industry and consumers. The Pinal Rail Corridor Group was formed to look at railroad expansion plans, assess the local impact and the safety impact. The Pinal Rail Corridor Group is made up of Pinal County, the communities of Maricopa, Casa Grande and Eloy and Union Pacific. The identity and location of the grade-separated crossings will be determined by the individual governments within the rail corridor group in the future. The agreement calls for construction on the first grade-separated crossing to begin within the next 10 years. "That may seem like a long time away but the agreement outlines a realistic timeline for planning, engineering and land acquisition," Supervisor Lionel Ruiz said. Ruiz oversees the Eloy region, which will be affected by the double track project. Ruiz noted that grade-separated crossings require more land to start the approach, bridge or underpass and the return to ground level. "There are more at-grade public crossings in Pinal County than any other county affected by the Union Pacific's expansion," Supervisor Sandie Smith said. "Twenty-six crossings will require modifications as a result of the double track project. I applaud the participants for choosing to work constructively in the name of safety and convenience." County Supervisors and the mayors are optimistic that the landmark agreement will set the stage for a long-lasting, constructive working relationship between the regional players and the railroad. To address long-term growth, new freeways, parkways, rail improvements, and transit options are needed to move people and goods efficiently. Hear about future multimodal transportation opportunities and plans for Pinal's circulation future. Ensuring quality employment opportunities so residents can live, work and play close to home is an important Pinal vision component. Join the discussion about the importance of creating appropriate mixed-use activity centers and employment areas that can position the region to attract future economic opportunities. How will the relationship between water and growth be addressed in Pinal County? This has been one of the most commonly asked questions during the year-long comprehensive planning effort. The expert panel will explore this relationship and offer opportunities to ensure Pinal's future can be achieved. Sustainability is simply defined as ensuring that the needs of existing residents are met while not compromising future generations' ability to meet their needs: a simple concept with complex implications. A panel of experts will explore sustainability and its relationship to Pinal County planning. Click here to learn more about the event speakers. In order to expedite registration at the event, and to receive a confirmation packet including event information and a map, click here. These workshops are the sixth round of public involvement events for the Pinal County Comprehensive Plan. For more information visit the project website or contact Peggy Fiandaca (PSA) Consulting Team Project Manager at 480.816.1811 or PSAinc@cox.net. The Pinal County Attorney's Office participated again this year in the Special Olympics Torch Run. Here are some photographs from last night's (Thursday, May 1, 2008) run, just outside Florence on highway 287. The Torch left Douglas, AZ on Tuesday morning to reach Phoenix on Friday for the opening of the Special Olympics at the ASU football stadium. The Pinal County Attorney's Office joined dozens of law enforcement agencies around the state in carrying the torch to the games.